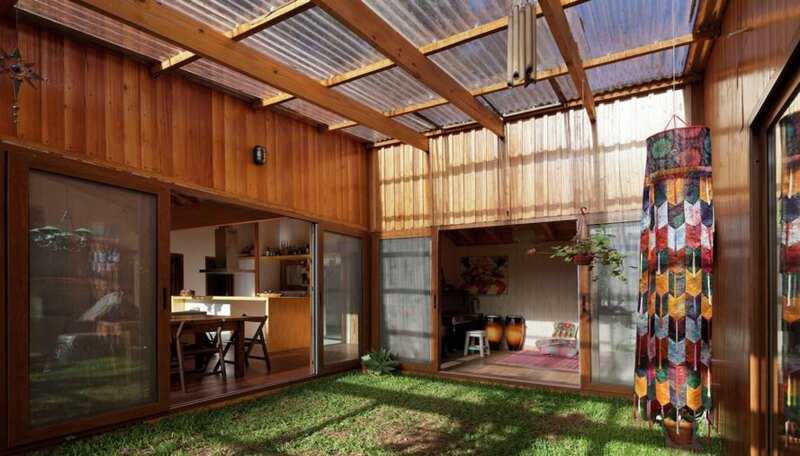 Buenos Aires-based IR arquitectura crafted a home that feels as if it grew out of the landscape. 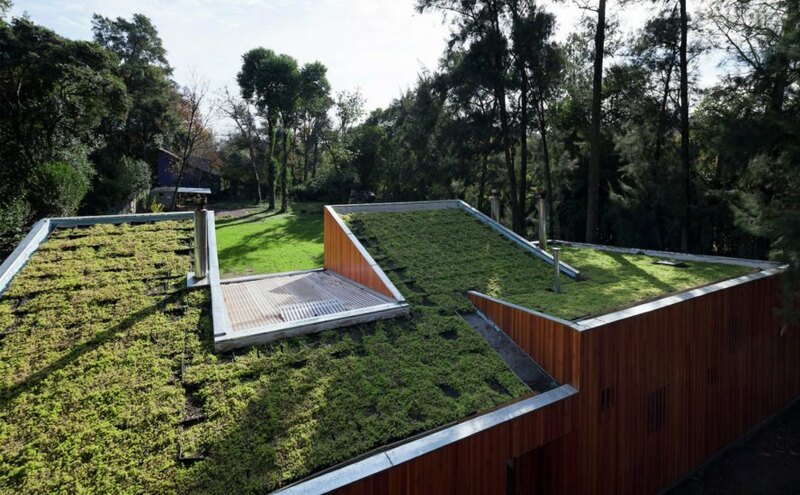 Set in a clearing in Tortuguitas, Argentina, the timber-clad AA House embraces nature with its green roof, inner courtyard, and large openings framing the outdoors. Thermal efficiency was a guiding design principle that informed everything from site orientation to material decisions. Built of locally sourced wood, AA House appears as a cluster of pitched timber boxes framed on each side by forest. 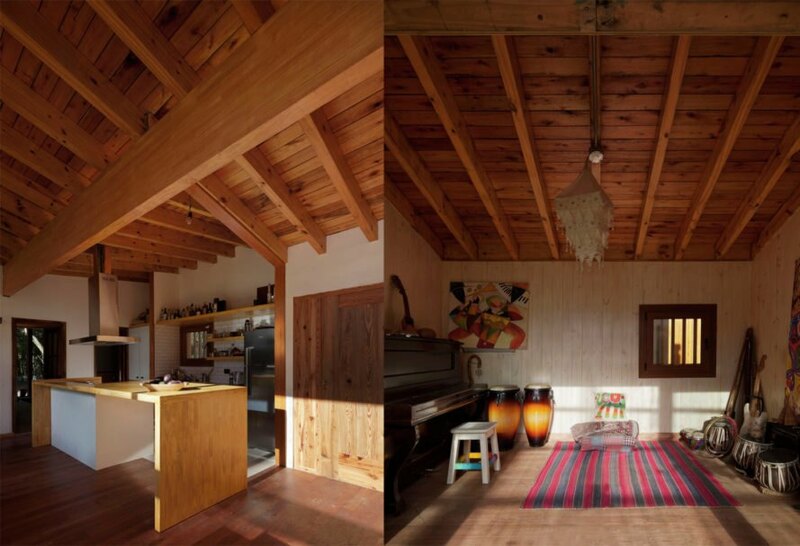 The main living areas and bedrooms are laid out linearly on an east-west axis and face north to “guarantee the best solar incidence range,” wrote the architects. 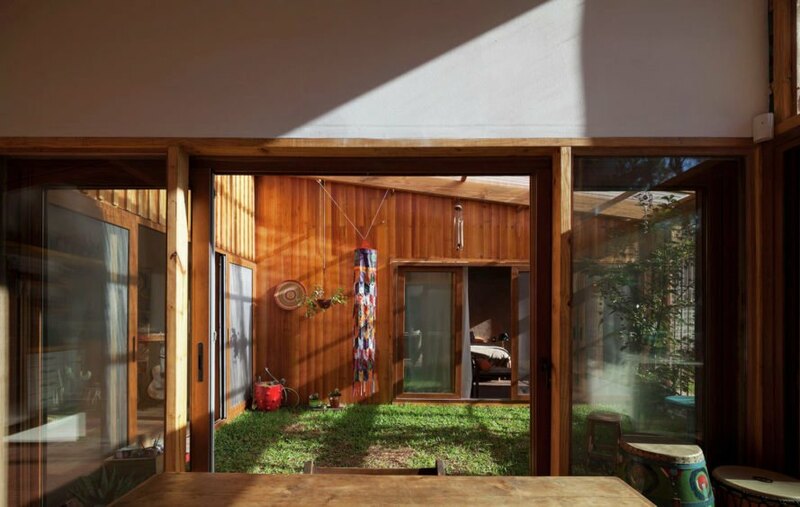 The common areas and greenhouse-like courtyard occupy the heart of the home and separate the master bedroom on the east side from the children’s bedrooms on the west end. 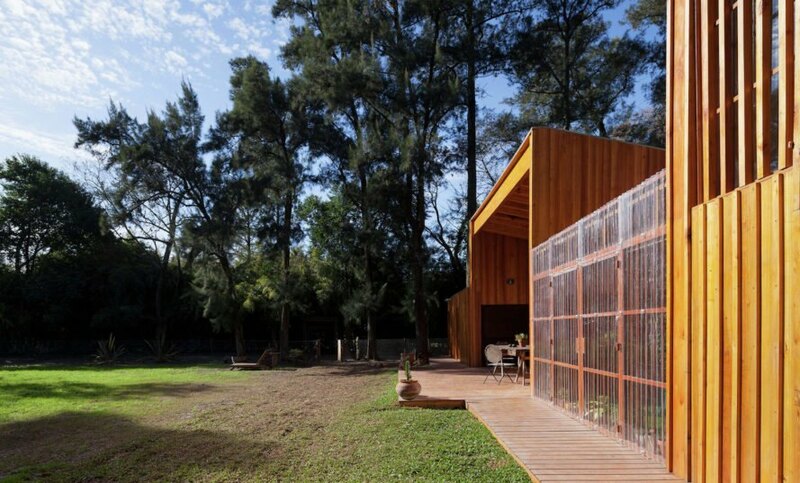 Buenos Aires-based IR arquitectura crafted a home that feels as if it grew out of the landscape. 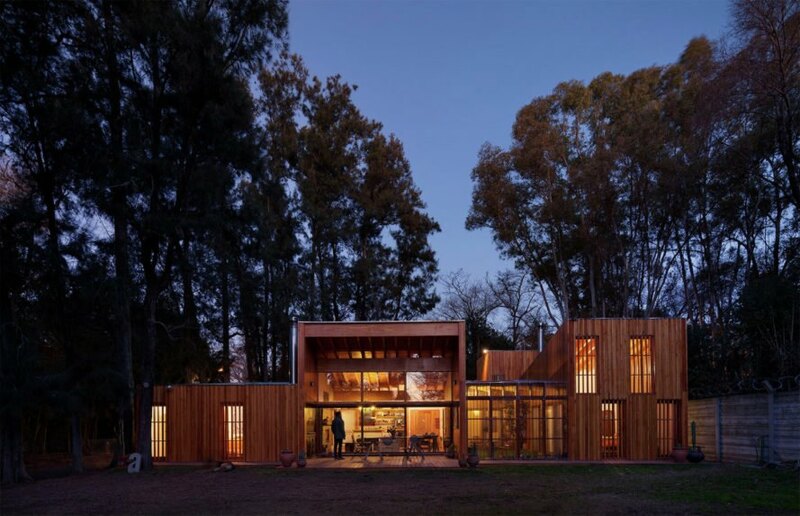 Set in a clearing in Tortuguitas, Argentina, the timber-clad AA House embraces nature with its green roof, inner courtyard with a polycarbonate roof, and large openings framing the outdoors. Thermal efficiency was a guiding design principle that informed everything from site orientation to material decisions. 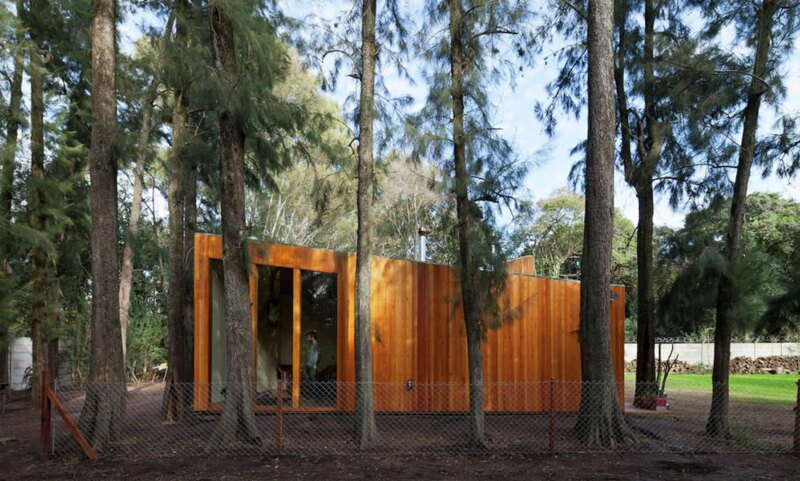 Built of locally sourced wood, AA House appears as a cluster of pitched timber boxes framed on each side by forest. The main living areas and bedrooms are laid out linearly on an east-west axis and face north to “guarantee the best solar incidence range,” wrote the architects. Earth walls finished with clay fill the spaces between wall studs and lend the advantage of high thermal mass by absorbing heat during the day and dissipating it at night. Vertical strips of timber clad the facade with matching vertical timber louvers installed over most of the glazed openings save for the large glazed wall on the north side of the living room that’s shielded by a deep overhang and left open for uninterrupted views.